The west side of Kaua’i is home to an interesting geological feature that almost seems out of place for an island of that size- a large canyon of volcanic origins. Nicknamed the Grand Canyon of the Pacific”, Waimea Canyon shares little with its much larger “cousin” in Arizona &Nevada other than visual similarities. For once, Grand Canyon of the Colorado river is 277 miles (443 km) long, , up to 18 miles (29 km) wide and over a mile deep, while Waimea Canyon is “only” 10 miles (16km) long, 2.5 miles (4km) wide at its widest point and 2800 feet (850 m) deep. The main similarity between the two is the approximate time frame they were formed- it took 6 millions of years for Grand Canyon to form into it's present state, Waimea Canyon is a little younger younger, at around 5 million years. However, the location of the Grand Canyon was being reshaped by geological processes and carved by ancient rivers since the last great sea receded, around 80 million years ago. Kaua'i, on the other hand, started emerging as an island only 1 million years prior to formation of the canyon. Waimea Canyon, just like the entire island of Kaua’i, is of volcanic origins. The two sides of the Canyon formed at a different time periods and are of dissimilar lava flows. 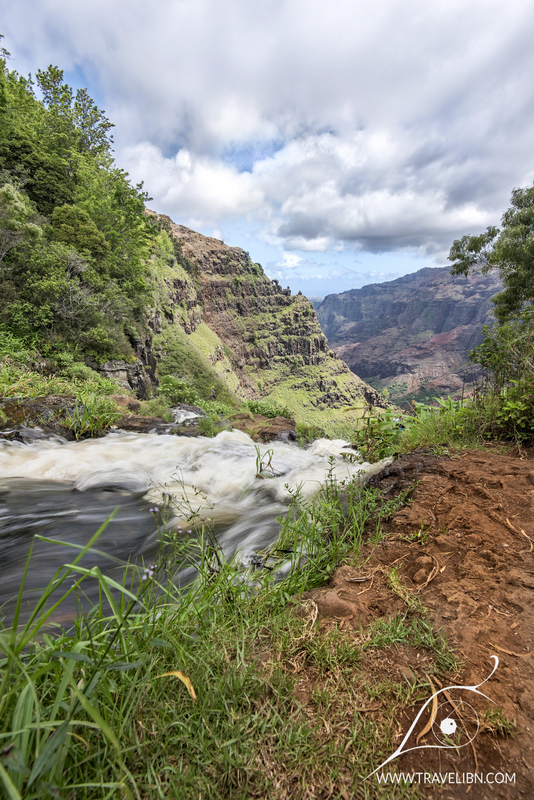 The west side of the canyon is made of lava flow originated from the volcano that formed the island of Kaua’i and it is respectively older than the east side. The later is a result of a massive subsidence (sinking) of land that was later filled with lava flows of what is called “Olokele member”. 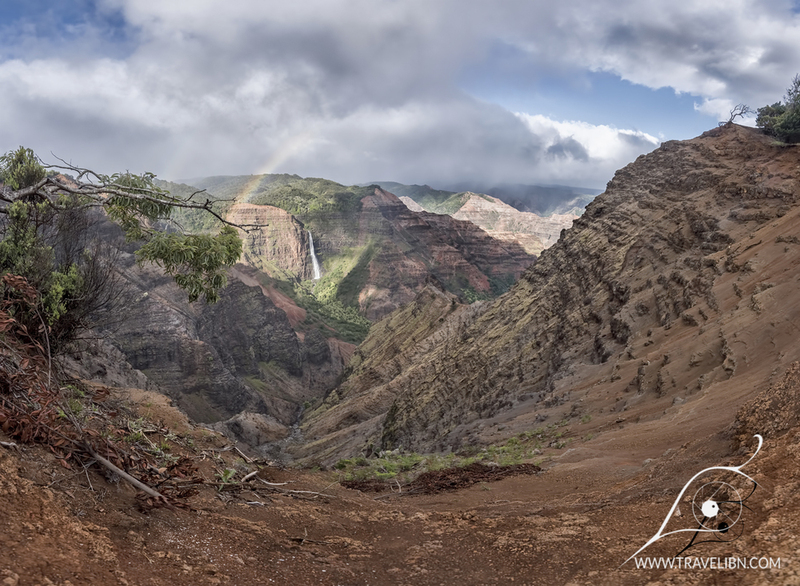 The next phase of Waimea Canyon formation is wind and water erosion. 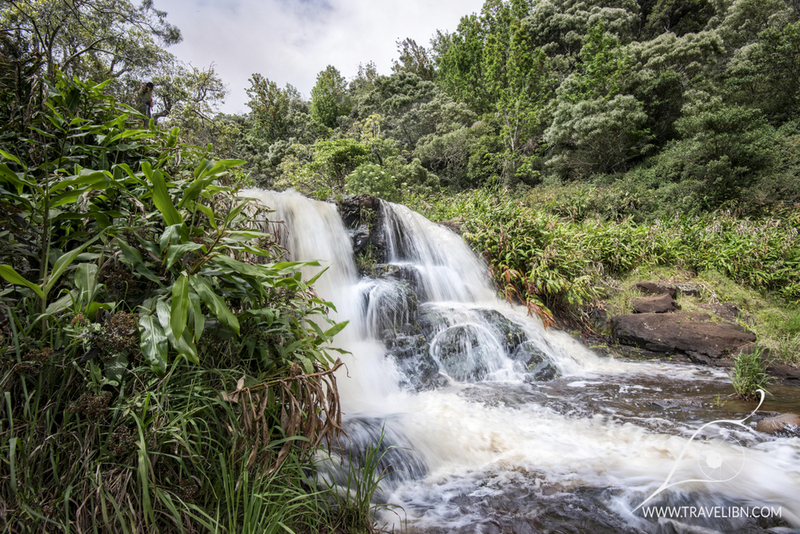 Waimea River is “fueled” by a permanent source of water originating 10 miles to the east- Mount Waialeale, one of the wettest spots on the planet. For four million years, rainwater draining down the slopes of Alaka’i Swamp in numerous streams concentrating into Waimea River, carved (and still is) the amazing shapes of Waimea Canyon. The dry winds blowing across the canyon walls towards the ocean contribute further to the act of creation. Waimea Canyon State Park is located on the west side of the island and is directly attached to Kaua’i other natural wonder- Koke’e State Park. In fact, some of the canyon hikes are accessible only from Koke’e by following the 4-wheel only Mohihi-Camp 10 road. To get to the state park’s boundary, follow Hwy 50 heading south until you reach an intersection with Waimea Canyon Drive (Highway 550). The road is climbing steadily in a series of switchbacks, reaching an altitude of around 3500 feet at its highest point. There are few lookouts along the road, as well as trail heads that start just alongside highway 550. You can also stop at several turn-arounds overlooking Waimea Canyon. First point of interest alongside Hwy 550 comes at mile 10 (there are easy to spot mile markers on the side of the road) in form of Waimea Canyon Lookout. What a view! Drive 3 miles uphill to even better Pu’u Ka Pele Lookout, where Waimea Canyon truly uncovers its otherworldly beauty and unspoiled majesty. Incredibly steep, painted in palette of greens, yellows and hues of red, carved by eons of erosion canyon walls leave a permanent mark in one’s mind. 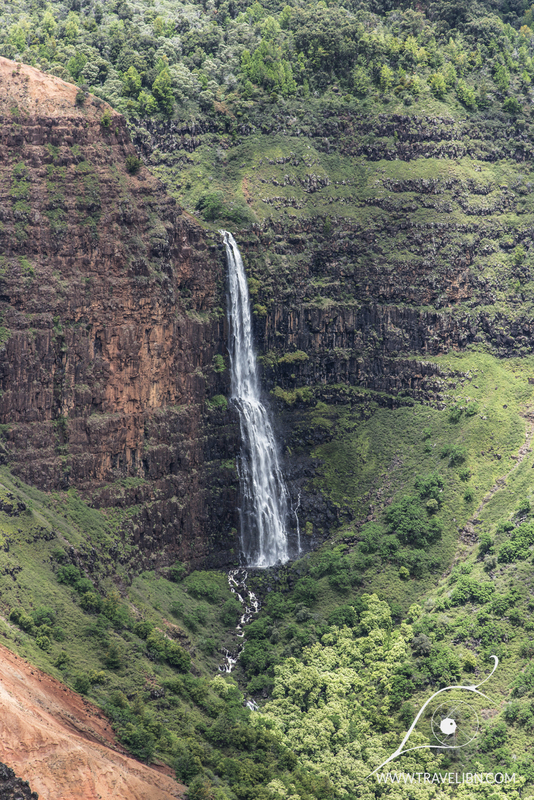 Just as if it wasn’t enough beauty to spoil the eyes, an amazing feature shines on the left hand side- Waimea Canyon’s signature landmark, an 800 foot tall cascading waterfall named Waipoo Falls. The sight of a reddish tanned river (Waimea means Red River in Hawaiian language) of water rushing down the lava cliffs truly is a magical experience. Waimea Canyon from one of the many lookouts along the road. One more viewpoint with a parking lot is located just before mile marker 14 and it’s called Pu’u Hinahina Lookout. From here, you can see both sides of the canyon and, if weather cooperates, the island of Niha'u on the opposite side of the lookout. Word of precaution- check with the park's official site or call them directly to gain information about the current state of trails and conditions on them. There is a lot of disinformation online, some described hikes either do not exist anymore (due to lack of maintenance and/or trail damage) or are extremely hazardous and should be avoided.